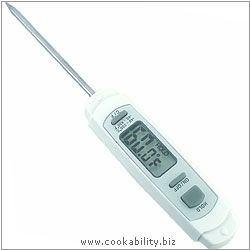 a digital thermometer with stainless steel probe. Range -40° to +230°C. Hold the recorded temperature feature. Snap on sheath and lanyard included (not shown). Uses a standard G13-A button battery which is included.